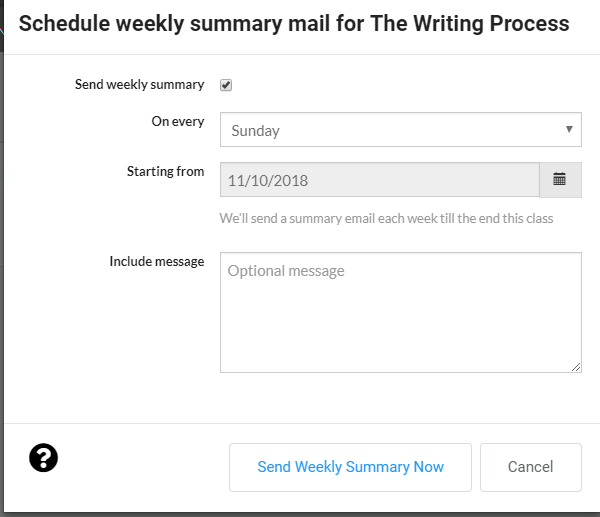 Choose whether to send a weekly summary email or not, and which day to send it. Often, it is helpful for student's to have a weekly summary and reminder of what has been completed and what is due. Wet Ink can send an automatic weekly email, set to any day of the week you choose. To set your email, you will go to the 'Class Administration', choose 'Weekly Email', then click on the 'Setup Weekly Email' button. Then, a pop-up will give the option of disabling, choosing a day of the week, starting date, and adding optional message.